张妮娜, 上官周平, 陈娟. 植物应答缺铁胁迫的分子生理机制及其调控[J]. 植物营养与肥料学报, 2018, 24(5): 1365-1377. ZHANG Ni-na, SHANGGUAN Zhou-ping, CHEN Juan. Molecular physiological mechanism and regulation of plant responses to iron deficiency stress[J]. Journal of Plant Nutrition and Fertilizers, 2018, 24(5): 1365-1377. Abstract: Iron is an essential micronutrient for plant growth and development. Although iron is abundant in soil, its bioavailability is very low, especially in alkaline calcareous soils, where high pH and high bicarbonate levels severely reduce the availability of iron in the soil. Therefore, it has become a hot topic in this field that how to effectively improve the plant’s utilization efficiency of iron and enhance the plant’s response to iron deficiency. This article focused on two different iron uptake mechanisms in plants and reaction of plants in response to iron deficiency stress, and reviewed the presently discovered genes involved in the regulation of iron deficiency in plants and elaborated the newly discovered NRAMP genes related to phagocytosis mechanism. The paper also introduced a number of related signals induced by iron deficiency, including plant hormones, gas signaling molecules and microRNAs, in addition, many approaches to improve the bioavailability of iron in plants and thus effectively alleviate iron deficiency stress were also proposed, including the transduction of genes related to iron absorption, the control of factors related to iron uptake, and the implementation of various agronomic measures. Finally, the article made a preliminary prospect on the future research directions of plant phagocytosis mechanism, iron deficiency induction signal and new ways to improve plant iron nutrition. 李利敏, 吴良欢, 马国瑞. 植物吸收铁机理及其相关基因研究进展[J]. 土壤通报, 2010, (4): 994–999. Li L M, Wu L H, Ma G R. Research progress on the mechanism of iron uptake by plants and related genes[J]. 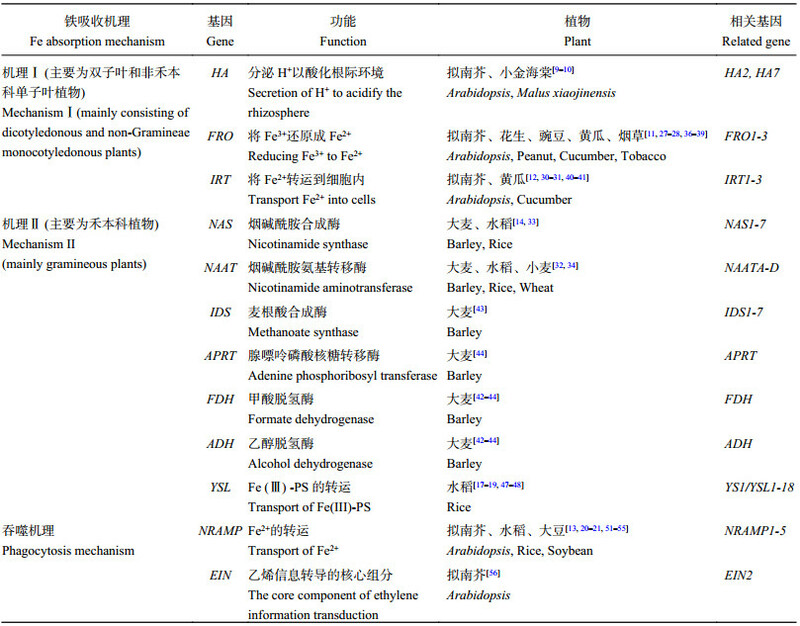 Chinese Journal of Soil Science, 2010, (4): 994–999. 张进, 吴良欢, 孔向军, 等. 铁锌混合肥喷施对豌豆子粒铁、锌、可溶性糖和维生素C含量的影响[J]. 植物营养与肥料学报, 2006, 12(2): 245–249. 段立红, 丁红, 李文学, 等. 机理Ⅰ植物铁吸收与运输的分子机制[J]. 植物营养与肥料学报, 2007, 13(4): 739–744. 李俊成, 于慧, 杨素欣, 等. 植物对铁元素吸收的分子调控机制研究进展[J]. 植物生理学报, 2016, 52(6): 835–842. Li J C, Yu H, Yang S X, et al. Research advances in the molecular regulation mechanism of plant iron absorption[J]. Journal of Plant Physiology, 2016, 52(6): 835–842. 申红芸, 熊宏春, 郭笑彤, 等. 植物吸收和转运铁的分子生理机制研究进展[J]. 植物营养与肥料学报, 2011, 17(6): 1522–1530. Shen H Y, Xiong H C, Guo X T, et al. Advances in molecular mechanism of plant uptake and transport of iron[J]. Plant Nutrition and Fertilizer Science, 2011, 17(6): 1522–1530. 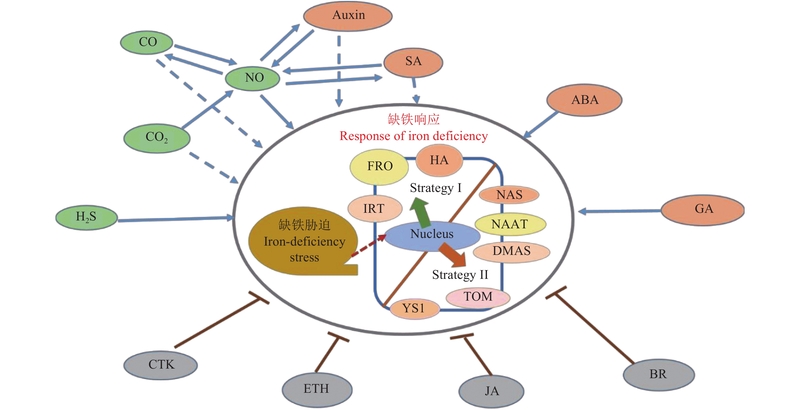 Zuo Y, Zhang F. Soil and crop management strategies to prevent iron deficiency in crops[J]. Plant & Soil, 2011, 339(1-2): 83–95. Singh S P, Keller B, Gruissem W, et al. Rice NICOTIANAMINE SYNTHASE 2 expression improves dietary iron and zinc levels in wheat [J]. Theoretical & Applied Genetics, 2016, 130(2): 283–292. Waters B M, Blevins D G, Eide D J. Characterization of FRO1, a pea ferric-chelate reductase involved in root iron acquisition[J]. Plant Physiology, 2002, 129(1): 85–94. Mori S. Reevaluation of the genes induced by iron deficiency in barley roots[J]. Soil Science and Plant Nutrition, 1997, 43(Suppl): 975–980. Nakanishi H, Okumura N, Umehara Y, et al. Expression of a gene specific for iron deficiency (Ids3) in the roots of Hordeum vulgare [J]. Plant and Cell Physiology, 1993, 34(3): 401–410. Von Wiren N, Peltier J B, Rouquie D, et al. Four root plasmalemma polypeptides under-represented in the maize mutant ys1 accumulate in a Fe-efficient genotype in response to iron-deficiency[J]. Plant Physiology and Biochemistry, 1997, 35(12): 945–950. Yamaguchi H, Takahashi M, Nishizawa N K, et al. Establishment of a screening system for " Fe (III)-phytosiderophore” transporter protein from Fe-deficient barley roots[M]. Springer Netherlands, 1997. 291–292. Senoura T, Sakashita E, Kobayashi T, et al. The iron-chelate transporter OsYSL9 plays a role in iron distribution in developing rice grains[J]. Plant Molecular Biology, 2017, 95(4-5): 1–13. Ishimaru Y, Takahashi R, Bashir K, et al. Characterizing the role of rice NRAMP5 in manganese, iron and cadmium transport[J]. Scientific Reports, 2012, 2(6071): 286. Matsuoka K, Furukawa J, Bidadi H, et al. Gibberellin-induced expression of Fe uptake-related genes in Arabidopsis [J]. Plant and Cell Physiology, 2013, 55(1): 87–98. Lei G J, Zhu X F, Wang Z W, et al. Abscisic acid alleviates iron deficiency by promoting root iron reutilization and transport from root to shoot in Arabidopsis [J]. Plant Cell & Environment, 2014, 37(4): 852–863. Song Y, Dong Y, Kong J, et al. Effects of root addition and foliar application of nitric oxide and salicylic acid in alleviating iron deficiency induced chlorosis of peanut seedlings[J]. Journal of Plant Nutrition, 2016, 40(1): 63–81. Zhai L, Xiao D, Sun C, et al. Nitric oxide signaling is involved in the response to iron deficiency in the woody plant Malus xiaojinensis [J]. Plant Physiology & Biochemistry, 2016, 109: 515–524. Kong W W, Yang Z M. Identification of iron-deficiency responsive microRNA genes and cis-elements in Arabidopsis [J]. Plant Physiology and Biochemistry, 2010, 48(2): 153–159. 李华, 郜明泉, 苏小雨, 等. 拟南芥中缺铁反应性microRNAs的鉴定[J]. 中国生物化学与分子生物学报, 2014, 30(3): 291–297. Li H, Hao M Q, Su X Y, et al. Identification of iron-deficient microRNAs in Arabidopsis thaliana [J]. Journal of Chinese Biochemistry and Molecular Biology, 2014, 30(3): 291–297. Boonyaves K, Wu T Y, Gruissem W, et al. Enhanced grain iron levels in rice expressing an iron-regulated metal transporter, nicotianamine synthase, and ferritin gene cassette[J]. Frontiers in Plant Science, 2017, 8(158): 130. Suzuki M, Morikawa K C, Nakanishi H, et al. Transgenic rice lines that include barley genes have increased tolerance to low iron availability in a calcareous paddy soil[J]. Soil Science & Plant Nutrition, 2008, 54(1): 77–85. Gupta R K, Gangoliya S S, Singh N K. Reduction of phytic acid and enhancement of bioavailable micronutrients in food grains[J]. Journal of Food Science & Technology, 2015, 52(2): 676. Lucca P, Hurrell R, Potrykus I. Genetic engineering approaches to improve the bioavailability and the level of iron in rice grains[J]. Theoretical and Applied Genetics, 2001, 102(2): 392–397. Zuo Y, Zhang F. Iron and zinc biofortification strategies in dicot plants by intercropping with gramineous species: a review[M] Springer Netherlands, 2009. 571–582.